Larry Lessig is an accomplished author, lawyer, and professor, and until recently, was one of the leading active public intellectuals in the Internet space. But as I wrote in my review of his last book (Is Our Republic Lost? ), in the past few years Lessig has changed his focus from Internet law to reforming our federal government. But that doesn’t mean Lessig has stopped thinking about our industry, as the dialog below will attest. Our conversation came about last month after I finished reading Code and Other Laws of Cyberspace, Version 2. The original book, written in 1999, is still considered an authoritative text on how the code of computing platforms interacts with our legal and social codes. In 2006, Lessig “crowdsourced” an update to his book, and released it as “Version 2.0.” I’d never read the updated work (and honestly didn’t remember the details of the first book), so finally, six years later, I dove in again. It’s a worthy dive, but not an easy one. Lessig is a lawyer by nature, and his argument is laid out like proofs in a case. Narrative is sparse, and structure sometimes trumps writing style. But his essential point – that the Internet is not some open “wild west” destined to always be free of regulation, is soundly made. In fact, Lessig argues, the Internet is quite possibly the most regulable technology ever invented, and if we don’t realize that fact, and protect ourselves from it, we’re in for some serious pain down the road. And for Lessig, the government isn’t the only potential regulator. Instead, Lessig argues, commercial interests may become the most pervasive regulators on the Internet. Indeed, during the seven years between Code’s first version and its second, much had occurred to prove Lessig’s point. But even as Lessig was putting the finishing touches on the second version of his manuscript, a new force was erupting from the open web: Facebook. And a year after that, the iPhone redefined the Internet once again. 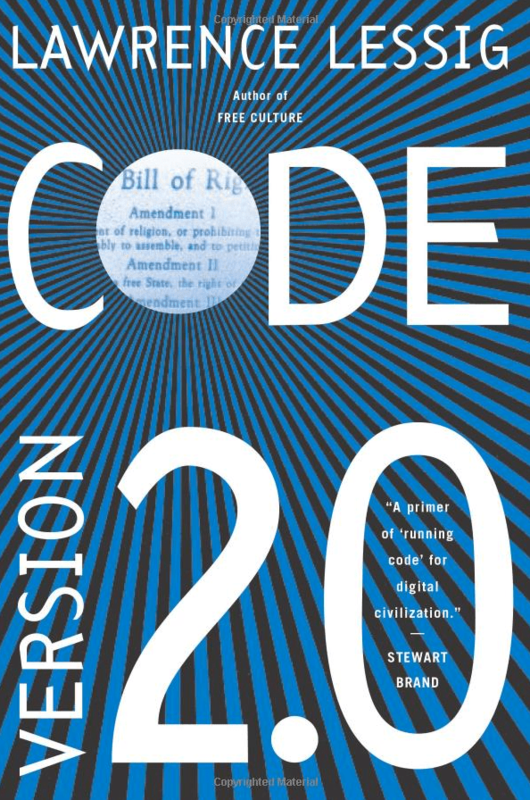 In Code, Lessig enumerates several examples of how online services create explicit codes of control – including the early AOL, Second Life, and many others. He takes the reader though important lessons in understanding regulation as more than just governmental – explaining normative (social), market (commercial), and code-based (technological) regulation. He warns that once we commit our lives to commercial services that hold our identity, a major breach of security will most likely force the government into enacting overzealous and anti-constitutional measures (think 9/11 and the Patriot Act). He makes a case for the proactive creation of an intelligent identity layer for the Internet, one that might offer just the right amount of information for the task at hand. In 2006, such an identity layer was a controversial idea – no one wanted the government, for example, to control identity on the web. But for reasons we’re still parsing as a culture, in the six years since the publication of Code v2, nearly 1 billion of us have become comfortable with Facebook as our defacto identity, and hundreds of millions of us have become inhabitants of Apple’s iOS. Instead of going into more detail on the book (as I have in many other reviews), I thought I’d reach out to Lessig and ask him about this turn of events. Below is a lightly edited transcript of our dialog. I think you’ll find it provocative. As to the book: If you consider yourself active in the core issues of the Internet industry, do yourself a favor and read it. It’s worth your time. You and your community updated your 1999 classic in 2006, a year or two before Facebook broke out, and several years before it became the force it is now. In Code you cover the regulatory architectures of places where people gather online, including MUDS, AOL, and the then-hot darling known as Second Life. But the word Facebook isn’t in the text. What do you make of Facebook, given the framework of Code v2? Lessig: If I were writing Code v3, there’d be a chapter — right after I explained the way (1) code regulates, and (2) commerce will use code to regulate — titled: “See, e.g., Facebook.” For it strikes me that no phenomena since 2006 better demonstrates precisely the dynamic I was trying to describe. The platform is dominant, and built into the platform are a million ways in which behavior is regulated. And among those million ways are 10 million instances of code being use to give to Facebook a kind of value that without code couldn’t be realized. Hundreds of millions from across the world live “in” Facebook. It more directly (regulating behavior) than any government structures and regulates their lives while there. There are of course limits to what Facebook can do. But the limits depend upon what users see. And Facebook has not yet committed itself to the kind of transparency that should give people confidence. Nor has it tied itself to the earlier and enabling values of the internet, whether open source or free culture. Q: Jonathan Zittrain wrote his book two years after Code v2, and warned of non-generative systems that might destroy the original values of the Internet. Since then, Apple iOS (the “iWorld”) and Facebook have blossomed, and show no signs of slowing down. Do you believe we’re in a pendulum swing, or are you more pessimistic – that consumers are voting with their dollars, devices, and data for a more closed ecosystem? Lessig: The trend JZ identified is profound and accelerating, and most of us who celebrate the “free and open” net are simply in denial. Facebook now lives oblivious to the values of open source software, or free culture. Apple has fully normalized the iNannyState. And unless Google’s Android demonstrates how open can coexist with secure, I fear the push away from our past will only continue. And then when our i9/11 event happens — meaning simply a significant and destructive cyber event, not necessarily tied to any particular terrorist group — the political will to return to control will be almost irresistible. The tragedy in all this is that it doesn’t have to be this way. If we could push to a better identity layer in the net, we could get both better privacy and better security. But neither side in this extremist’s battle is willing to take the first step towards this obvious solution. And so in the end I fear the extremists I like least will win. Q: You seem profoundly disappointed in our industry. What can folks who want to make a change do? Lessig: Not at all. The industry is doing what industry does best — doing well, given the rules as they are. What industry is never good at (and is sometimes quite evil at) is identifying the best mix of rules. Government is supposed to do something with that. Our problem is that we have today such a fundamentally dysfunctional government that we don’t even recognize the idea that it might have a useful role here. So we get stuck in these policy-dead-ends, with enormous gains to both sides left on the table. And that’s only to speak about the hard problems — which security in the Net is. Much worse (and more frustrating) are the easy problems which the government also can’t solve, not because the answer isn’t clear (again, these are the easy problems) but because the incumbents are so effective at blocking the answer that makes more sense so as to preserve the answer that makes them more dollars. Think about the “copyright wars” — practically every sane soul is now focused on a resolution of that war that is almost precisely what the disinterested souls were arguing a dozen years ago (editor’s note: abolishing DRM). Yet the short-termism of the industry wouldn’t allow those answers a dozen years ago, so we have had an completely useless war which has benefited no one (save the lawyers-as-soldiers in that war). We’ve lost a decade of competitive innovation in ways to spur and spread content in ways that would ultimately benefit creators, because the dinosaurs owned the lobbyists. I could have gone on for some time with Lessig, but I wanted to stop there, and invite your questions in the comments section. Lessig is pretty busy with his current work, which focuses on those lobbyists and the culture of money in Congress, but if he can find the time, he’ll respond to your questions in the comments below, or to me in email, and I’ll update the post. The Corporation (film – my review). A user-owned and governed transaction network dedicated to a certain segment of the transaction space forms the core for this layer. And a recipient could click that link and thereby securely and easily give that 25 cents…Would the group be interested in sending the message? And would the recipient see value in the capability? And in that there lies great opportunity for development of a vital utility as well as a path to a more involved citizenry, a more responsive government… and that data layer you mention. The mechanism is exceedingly simple involving a sort of virtual cash card, trust accounts, automated FEC reporting, tracking of limits and tax consequences, networking capabilities with other account holders…. and most importantly (for both theoretical and practical reasons)… external monetization all under a user-owned (or user majority owned) structure. For both theoretical and practical marketing reasons the same ‘virtual card’ is well-suited for charitable contribution and the support of independent journalism. *First position in other service relationships which may arise due to the obvious technical needs of such a network and its related platforms. *By sacrificing a small portion of its own pay system’s potential market (politics and charity) Google (or any other entity interested)… may secure a much more valuable place in the social media space, first access to an important data market… and in the long run a much larger share of the retail payment sector via their existing system. Bottom line:The political microtransaction, while a vital capability on its own… also acts as a catalyst for the establishment of an important ‘commons-oriented’ network I believe needed for better solution to multiple unaddressed scaling issues. This isn’t a small concept. And requires more than I’m able to give by myself. And while such a system is not without its problems or perils… I find it difficult to doubt its potential. But the silence is deafening. In time….I think this will happen. Thanks for kind words… I truly understand a concern that such a system could, in fact, be dangerous… (I’m assuming this is the hesitancy behind the ‘In time’ qualifier though I could be wrong). I’d like the opportunity to argue that such a system over time will result in a more capable… more involved…. and more tolerant electorate… but not without a few likely bumps along the road. And that, in fact… by creating the proper environment its possible to cultivate more a jurist’s mindset in a voter rather than that of a partisan or worse… a mob. But this requires also mechanisms to pressure a leadership class to abandon mechanisms expressly designed to cultivate a mob psychology to drive decision… all while preserving rights to free speech for both the politician and the voter. This isn’t easy to do but can and must be done. And I believe this structure… this network (or rather a horizontal network of interacting networks) all operating under agreed upon standards and rights… owned by neither a company nor government but rather its users…. is quite possibly a necessary piece of the landscape needed to do that. I also recognize that such a network could make things worse… But I don’t think so. And this can be up now. This is a framework for discussion. I naturally like my formulation but certainly welcome the consideration of alternatives. Money IS a tool of decision. The political microtransaction is an essential for scaling speech. Or even the public finance of elections… in which such a network could well play a positive role. Just one last note on that question about ‘disappointment in the industry’… I understand what he’s saying and tend to agree. Industries are going to do what’s in their interest… and its for that ‘supposed’ representative of the Commons… the government… to ensure those broader interests. But as Mr. Lessig knows…. they’re not doing it. And he understands it has a lot to do with the ‘weight’ of different influencers on legislators. Now I suggest this is largely a problem of scale (along with our failure to properly secure public rights when television and other media were developed but that’s another story). The recent PBS doc on the banking crisis pointed out that since Dodd-Frank the banking sector has pumped in $320 million lobbying dollars. But its enough to allow the banks to run roughshod over the political process… if you disagree, that’s fine. That’s what politics is all about. Speaking on a personal note, I’m fairly sure that if myself and the millions of others now homeless had had the ability to ‘scale our speech’ there’d be more care taken in these processes… and the nation would have been better off… not with ‘free houses’ but a more equitable process. Or maybe the public option for health reform would have at least been on the table? Of course its a sword that can cut both ways… but really this capability is simply extending to everyone the same ability to participate in a process now dominated by narrow interests (of whatever side). So bottom line I shouldn’t blame or be surprised that I’ve not had a single inquiry from any VC, nor any interest from this Industry organizations in addressing this need. Nevertheless, I see the good that cable at least did with C-Span… and would hope that… if not support… at least there would be some opportunity for this capability to be discussed. I’ve been out here five years without an inquiry from this industry. Without a better balance in the ‘weight’ of opinion inputs… the altruism dilemma stands un-checked and oligarchy inevitably results. And on the scale issue with a personal note… good banking requires a granularity of decision the TBTF banks are not willing to provide. And this civilization and the Western World are paying a heavy price for it. Lessig’s belief that government has a role to play in the Internet is the only weakness in his argument and for such a forward thinker it seems odd that he can’t see that this is the one place government is unnecessary and not welcome at the party. I disagree. Government made the Internet possible. And I’d hate to see its core run by an oligarchy of for profit companies. interesting thought, although people made the Internet possible, it just so happened that a lot of them worked for the government…semantics aside, government intervention, where capitalism and free enterprise are concerned has always proven to be a hindrance rather than a boon. Perhaps if we are more accepting of the inevitable cuts and bruises inherent in evolution of any kind, we may learn to appreciate the journey, much like learning to ride a bike. The government can’t protect us from everything, even ourselves, so I think it may be time to take the training wheels off. If you live on Facebook, you already have! It would seem that the burden lies with you to distinguish the Internet from all else. Seems to me it is always appropriate for the government to steer industry toward limits which will protect the public interest particularly re: privacy and security. And fair market dynamics. Remember that the nature of capitalism is to create monopoly. The nature of monopoly is to stifle innovation. You seem profoundly disappointed in our industry. What can folks who want to make a change do? Make our government do its job. Support efforts to remove money from politics. Have professional organizations embarrass regulators and courts into doing the right thing. Reveal examples of the perverse influence of money on politics and post to/tag with rootstrikers. If we define the parameters of use to mean regulation, you have a point but I don’t agree with that assignment of meaning. Facebook, iPhone, etc.. all require a range of use, a start and end point. Sure there is some governance in that and it’s codified but expression and engagement with others within the ecosystem are self-directed. With respect to commerce, it’s difficult to establish a entirely open platform or what I would term a continuous string. Companies or inventors seek to create a user experience and an effective way to monetize their product or service to sustain their creation and fuel its progress. Sure they require some level of control or guiding principles with respect to use, but that doesn’t necessary mean they are blocking progress. We all regulate on some level; for example – I’m sure John didn’t print every word from the interview, it was edited, controlled and directed on some level for his blog audience. Pretty much word for word!